Congratulations, you just got drafted into the NFL. Now what? Here’s what’s ahead of you: rigorous training, complicated playbooks, financial conundrums, intense pressure to perform—and temptation. Welcome to the big leagues. 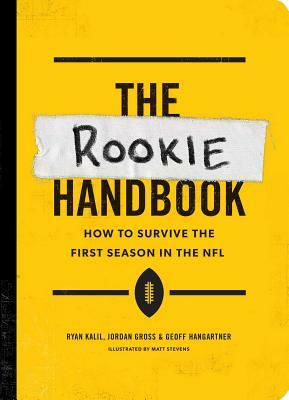 Informative, smart, funny, and beautifully illustrated, The Rookie Handbook has everything NFL rookies need to know to survive their first season of pro football, straight from veterans Ryan Kalil, Jordan Gross, and Geoff Hangartner. The three authors have a combined thirty years of NFL experience, but they too were rookies themselves, once upon a time. Much like rookies, NFL fans only know what they see on TV or read—obsessively following Rich Eisen and scouring obscure blogs for fantasy football info. But when it comes to what goes on in the inner sanctum, behind the locker room doors, it’s a mystery. The Rookie Handbook is the insider’s guide to that exclusive club, pulling back the curtain to reveal how players act and think—and what they do when no one is watching. Ryan Kalil is a five-time Pro Bowl player and has played center for the Carolina Panthers since 2007. Jordan Gross is a former offensive tackle for the Carolina Panthers; since his retirement in 2014, he has worked for The Panthers Network as a sideline reporter and hosts his own show with Travelle Wharton on Time Warner Cable Sports called This Is Gross. Geoff Hangartner is a former offensive lineman for the Carolina Panthers and the Buffalo Bills. "Three of the funniest and smartest guys to walk the Carolina Panthers' locker room have combined on a fun sports book meant to help first-year players in the NFL." "[A] humorous, illustrated look at the day-to-day life of pigskin gladiators . . . a must read for first year players and long-term fans alike." "Lighthearted, enlightening . . . [with] equal parts wit and wisdom." "[A] unique perspective on life in the NFL." "Put down the playbook and study this: Insider knowledge on how to survive life in the NFL."